With all of my Warmachine stuff painted I felt like I could justify starting a new, non-GW project and I finally managed to convince my brother to get into Malifaux with me. I've fancied getting some of Malifaux's miniatures for years as I think their plastics are simply gorgeous. 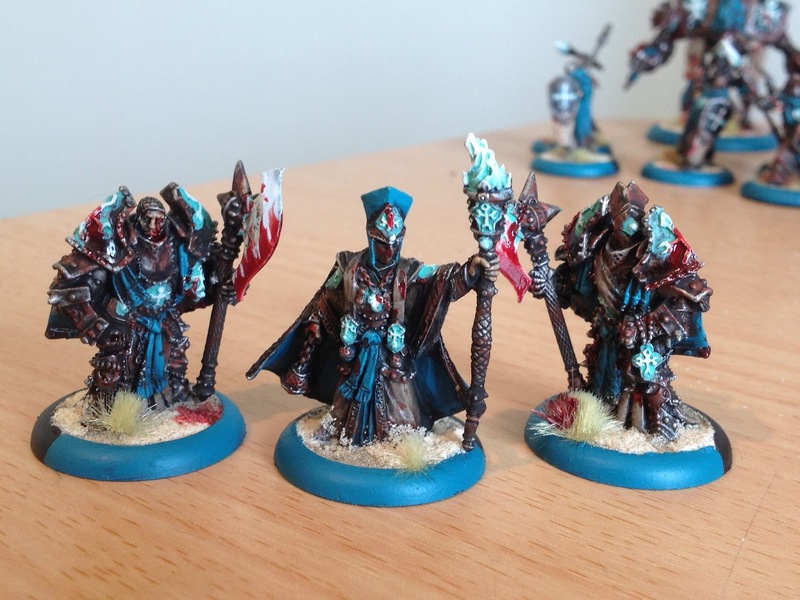 Though they lack the customisability of GW I do think Wyrd's miniatures are of a similar quality as the level of detail and the crispness of the sculpts are top-notch. The style of sculpt is certainly different, incorporating much more flat space than GW and being more in line with true-scaling than heroic scaling, but I have encountered this kind of thing before with Kingdom Death miniatures and I look forward to the challenge. For my first crew I have decided to go with 'The Guild's Justice' crew because they are ghost-rider-esque cowboys who are led by a blind ninja lady who is literally called Lady Justice. It doesn't really get much cooler than that in my opinion! 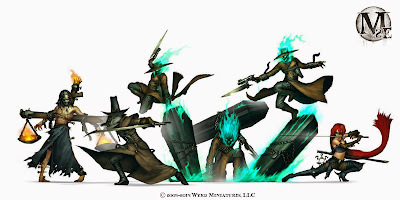 As a fan of Westerns I think it is quite likely that as I expand into Malifaux further I will probably stick with the Guild as my main faction and I have already bought the Brutal Effigy to support any Guild crews I build. 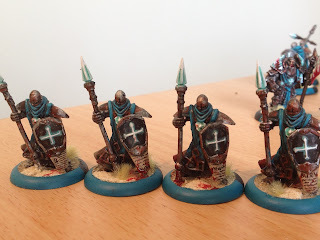 As this is such a small model count game I plan on painting each miniature individually in order to try and paint them to the best of my ability. While I do like the colour scheme presented in the art, I would like to try and incorporate more of the Guild's signature colour of red into my miniatures though I'm not yet sure how I'm going to do this. 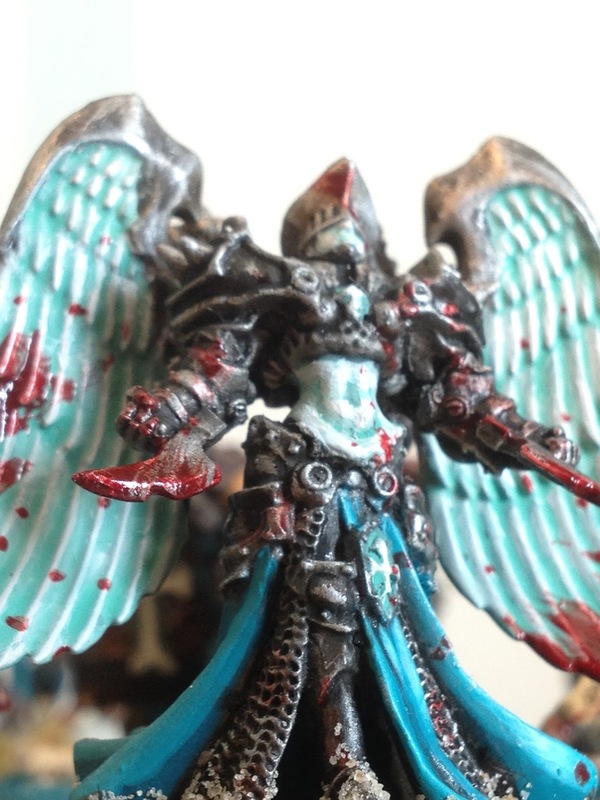 I'd also like to give NMM a try but I've had mixed results with this in the past and may abandon it if I can't get the metallics quite right. 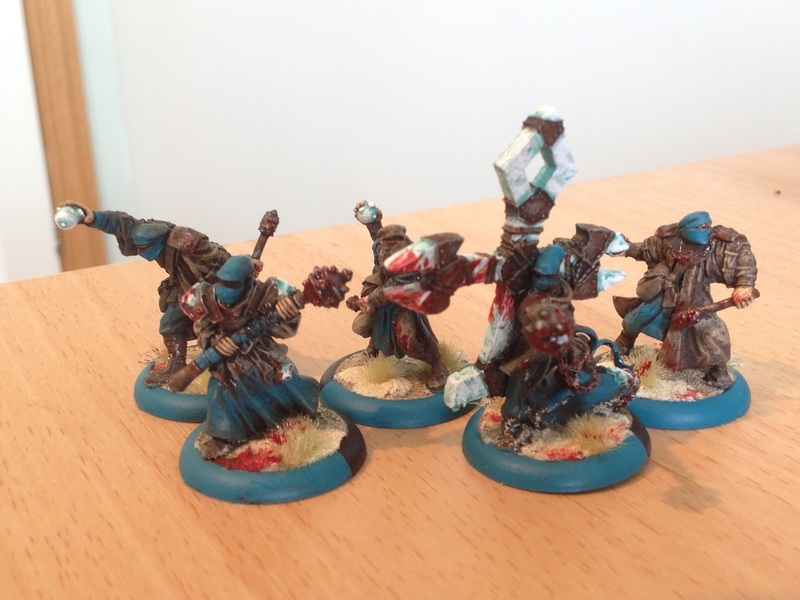 Once I have painted up this crew I think I will pick up a few more general Guild enforcers and minions that can run well with most masters before picking up Perdita Ortega or Sonnia Criid's crew box so I have another master to play with. I'd also love to get the Brutal Emissary as the miniature is simply badass and I'd love to see it stomp across the board terrifying my brother! He has started off with Seamus's crew but has no intention of staying within a given faction and is likely to pick up a range of different crews. 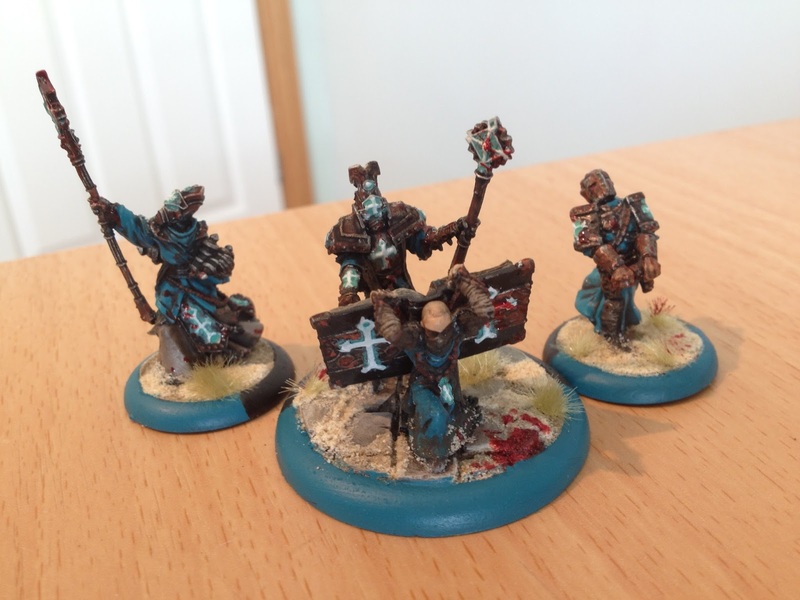 As we are going to be away from home for the next few months at university we probably won't have chance for a game until near Christmas, but when we do I will make sure to post my thoughts on the blog. 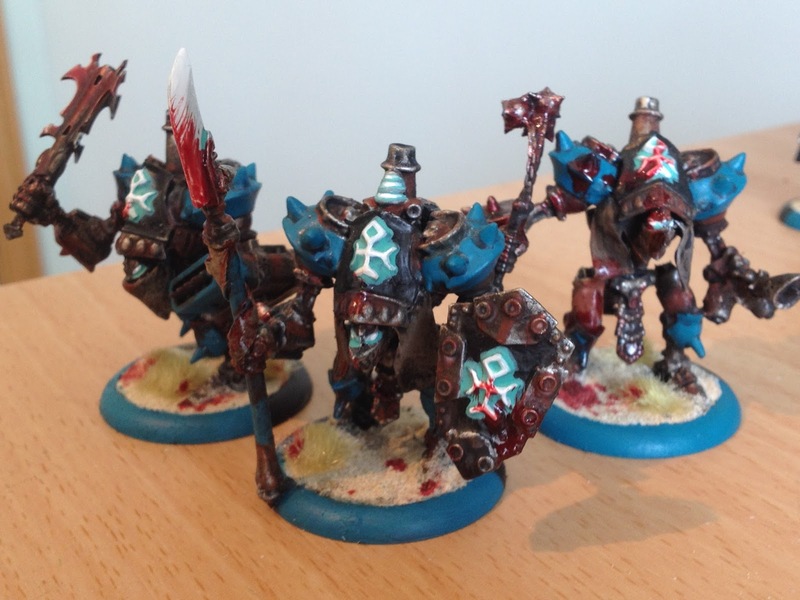 After a few weeks of working on my Menites on and off I have finally managed to finish my Warmachine army to a standard I am happy with. 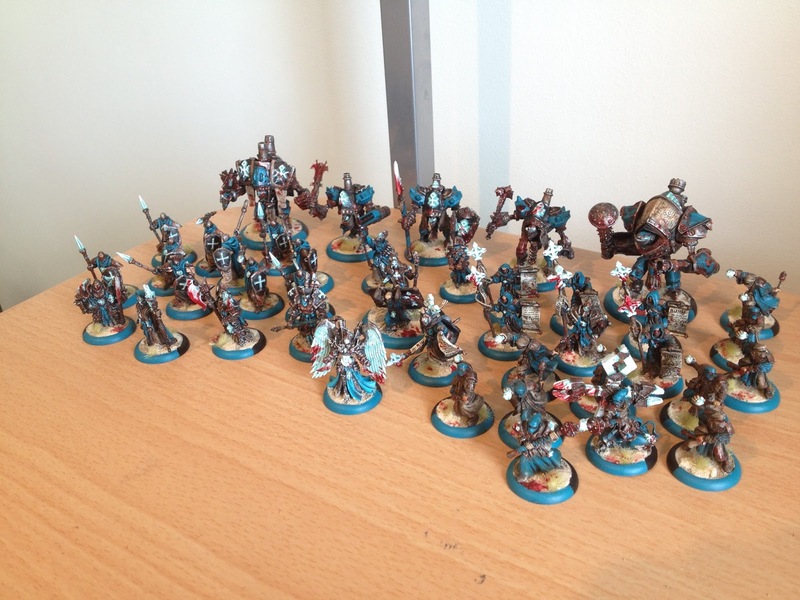 The force was painted in a non-traditional colour scheme (I'm fed up of painting red!) and I decided to really grunge-up my men and their machines to better reflect the steampunk nature of the setting. 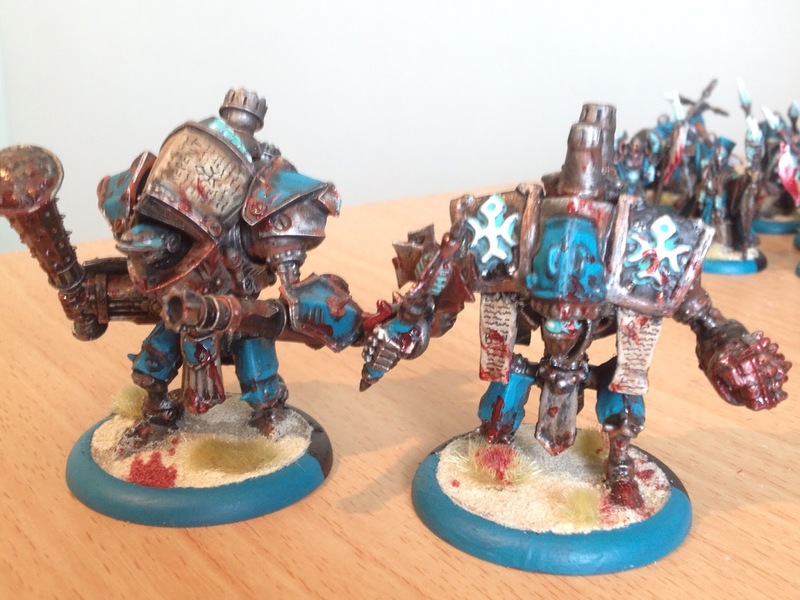 I always found the studio paint jobs for this game far too clean and while I may have overdone it on the rust and gore I am happy with the final results, especially as it contrasts so nicely with the glowing Menofixes. 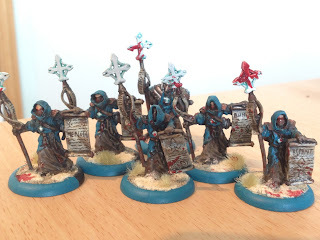 The glowing Menofixes were painted by washing Nihilakh Oxide over a grey base coat. Then painting everywhere except the recesses with Ulthuan Grey and then painting the centre of each part of the Menofix with Ceramite White. 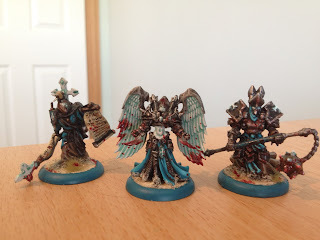 While not the most convincing glowing effect (for this I would recommend an airbrush or practicing OSL techniques which I'm not great at) it does the job quickly and efficiently. 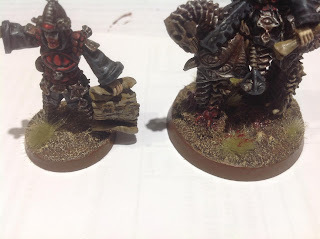 The bases were simply coated in a layer of sand (additional layers of sand added in the odd place to break it up a bit were done by simply putting a drop of glue on an area of base and dipping it in the sand again), then I glued some Mordheim Turf to the base and splattered on a bit of blood. I you have read either my Frostgrave Base Tutorial, or my Basing in the Realm of Death Tutorial, you will know I am a big fan of using Mordheim Turf as a simply way of breaking up the monotony of a base. While you can use other grasses and turfs I feel that for inhospitable landscapes like tundras, deserts, or the realm of death this stuff is simply perfect and looks great with some blood splattered on it. While I'm happy with this force I think it will be a while before I return to Warmachine miniatures. It was a nice distraction from GW miniatures but I think there are other styles of sculpting that I'd like to try painting before I return to the Iron Kingdoms.